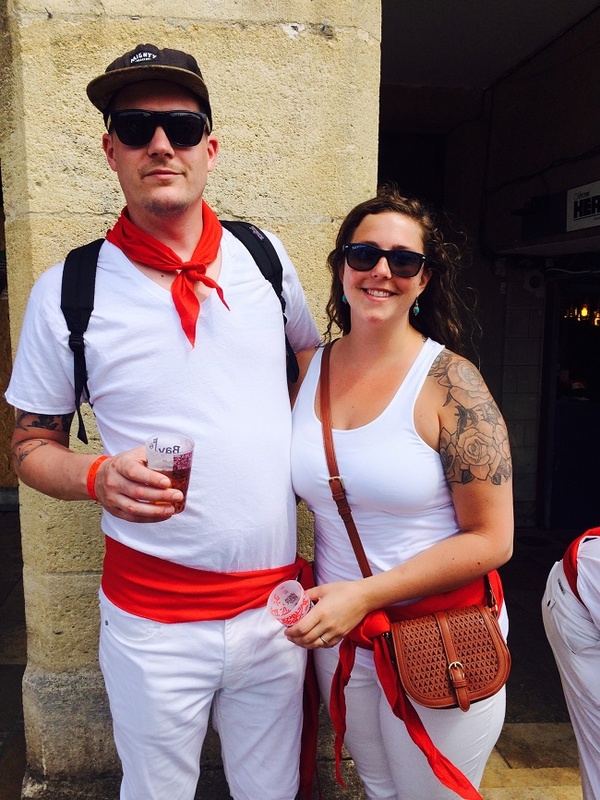 In addition to his visits to see artisan cheese maker, production of salt at Salies de Bearn and traditional methods of making jambon de Bayonne in Hagetmau, Café Presse chef de cuisine Patrick MacWhorter finished his trip to France at the Fête de Bayonne. 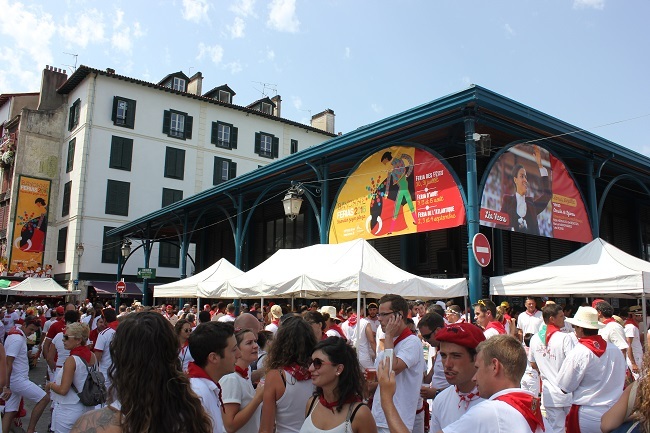 The Fête de Bayonne is the largest Basque festivals in France, and second in attendance only to Pamplona, on the Spanish side of the border. 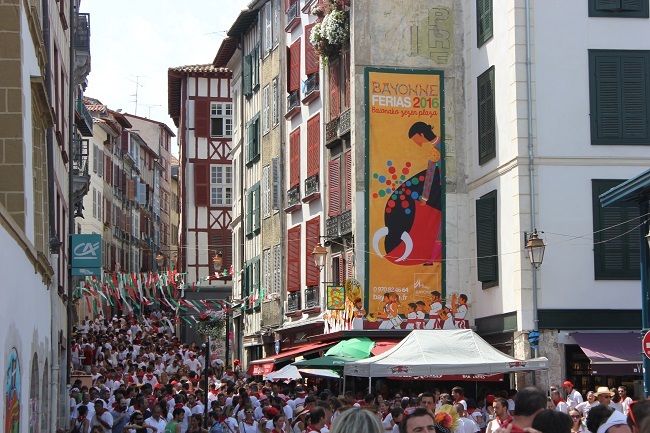 During the week of the Fête, Bayonne swells from a city of about 45,000 residents to a madhouse of over 600,000 revelers. As a guest of Fromagerie Agour, Pat was treated a bit like a visiting dignitary during his stay and received an invitation to the induction ceremony of the Confrérie de Jambon de Bayonne, an honorary society of aficionados of this Basque specialty. The event was preceded by a press conference and followed by a reception. Pat: The press conference and induction ceremony was a private event in the middle of Bayonne during the Fête in an open courtyard at a private school. The event had security at the entrance for invited guests only. 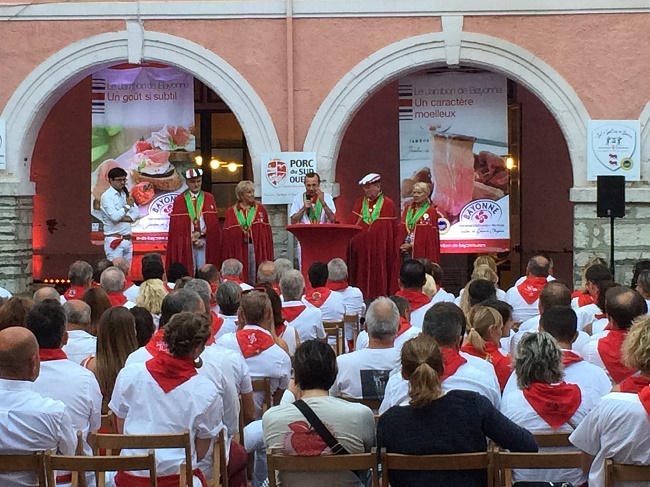 This included higher ups from newspapers, the top people in the Jambon Guild, famous old-style Basque singers (who would get everyone to stand and sing the old jambon de bayonne song in unison), photographers and others that were just presented to me as “important people”. And they all partied at the event until well after midnight and who knows how many legs of ham and bottles of wine were consumed. 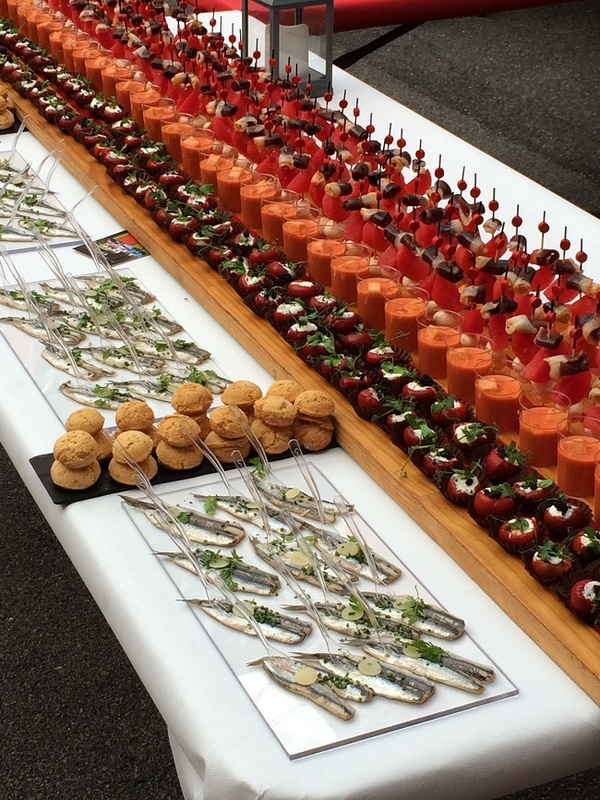 Reception after the induction ceremony for the Conferie de Jambon de Bayonne. New members are inducted to the Confrerie du Jambon de Bayonne. Love the cigarette on the drummer! 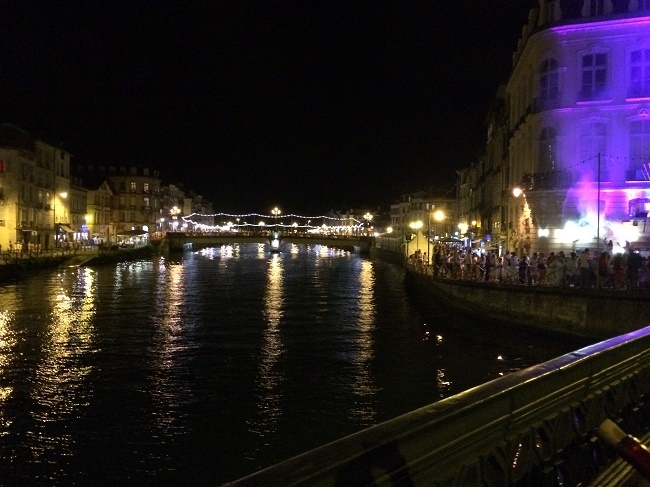 Of course, private events are only a part of the Fête de Bayonne, and spending time in the streets with the crowds is a must. Pat: The Fête de Bayonne itself was a blast, every age group from teenager to over 70 were having a blast together until sunrise. 600,000 to 800,000 people attending such a small city people were setting up camp all around the outskirts of the city and walking in. Military posts at every bridge and entrance into the city, patrols throughout the night and snipers on the roof where “King Leon” was overlooking the city. 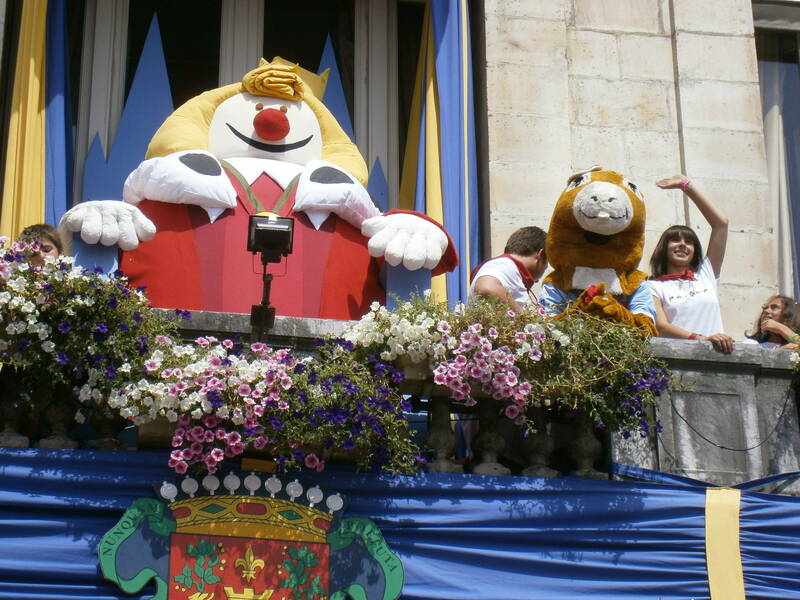 (note: Roi Leon is the unofficial mascot and master of the Fête de Bayonne. He and his court preside over the Fête and are celebrated during a parade through the streets). 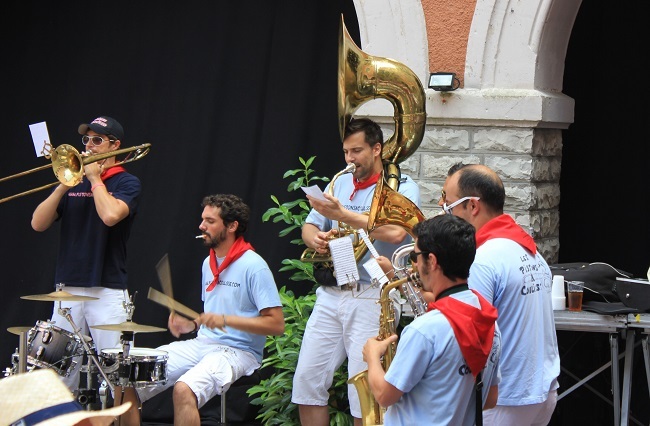 Pat: Groups of Marching bands would roam the city playing through alleys and stopping in front of random bars to get the patrons to join in song then move on to the next lucky group. Businesses would board up their doors early as a “precaution”, I did not see any violence or destruction, but local graffiti artists would come and put their art up to be seen for a day or two before being taken down. Street food was everywhere, everyone sold baguette sandwiches with cheese or jambon de bayonne, or just cups filled with sliced jambon de bayonne. I would go back in a heart beat. 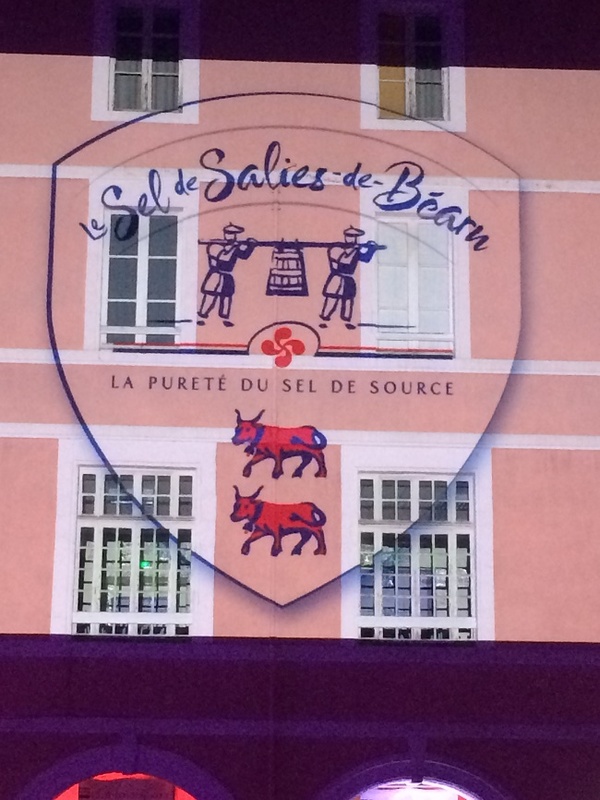 The logo of the salt works at Salies de Béarn projected on the building fronts of Bayonne during the Fête. The fête continued late into the night. This entry was posted in Stuff and tagged Cafe Presse, Charcuterie, France, Pays Basque, pork. Bookmark the permalink.